And she has drawn that future for the world to see. 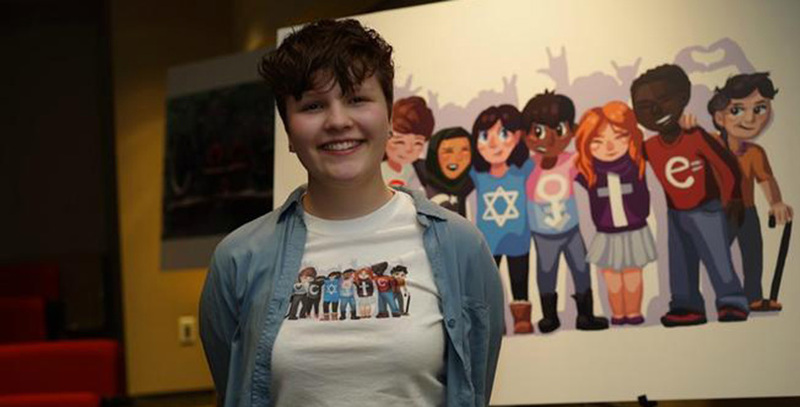 Sarah’s depiction of eight teenagers representing a range of diversity is the winner of the 2017 Doodle 4 Google competition. Sarah’s doodle, chosen from among 140,000 entries on the theme “What I See for the Future,” was displayed on the Google homepage last Friday and Saturday. In addition to the national exposure of her artistic talent, Google is giving her a boost for her education: a $30,000 college scholarship. Sarah also will have the opportunity to meet with the Google Doodle team at its Mountain View, Calif., complex, and her school will get $50,000 for technology to foster the next generation of STEM professionals. Google routinely posts user-generated doodles to recognize holidays, historical anniversaries, causes, and notable people. For this particular contest, Google selected four finalists in different age groups whose work reflected a variety of topics, from diverse communities and ancient animals to new energy sources and ways to minimize waste from discarded electronics products. Clearly, Sarah’s vision of a world where “everyone is safe and accepted wherever they go, whoever they are” was something special. “Ultimately, Sarah’s doodle captured the best of everything we saw, representing values like diversity, inclusion, and respect in an inspiring and creative image,” said William Floyd, head of external affairs for Google.